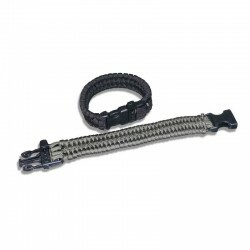 The paracord (or parachute cord or paracord) is a 3mm diameter cord around, resistant to 250 kg (550 lbs), originally used by the US military.It is now universally recognized as one of the necessities of any survival kit or outdoor activities, so its uses are numerous (the shelter braiding handles on tools). Paracord survival bracelet, designed to always have on about 3 meters of paracord. The clip is provided with a whistle so that it can be signaled in case of emergency. Wrist circumference up to 21 cm. Available in black or khaki. Lanyard made from about 1.5 meters of braided paracord, to embellish and improve the grip of knives, lamps, firesteel, etc. and have rope in all circumstances. Available in black, orange / black and brown. The paracord (or parachute cord or paracord) is a rope of about 3mm diameter, resistant to 250 kg (550 lbs), originally used by the US military. It is now unanimously recognized as one of the essential products of any survival kit or outdoor activities, as its uses are numerous (from the construction of shelters to the weaving of handles on the tools). It consists of a nylon core (7 strands that can be used independently if necessary) and a nylon shell as well. 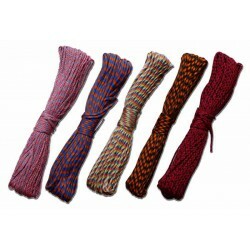 Rope very flexible, pleasant to handle, to tie and untie.